released it last night to tijgetje, traded it for a book on her bookshelf I was interested in. And a very funny book it was indeed. David Lodge knows how to write. He is very entertaining and provides lots of interesting and amusing details. The strenght of the book is in the details and the clever observations the author makes. In book 2 we follow the same two characters but a lot of others too. It's about the intenational conference circuit; how scholars travel around the globe to attend endless lecturing and discussiongroups about Structuralism (for example). The nice thing about this book is the dozens of excentric characters we get to know. I just love Cheryl Summerbee, the British Airways check-in girl. The final book is about Robyn Penrose and Victor Wilcox, two new characters, but they fit into the overall story; it's set some years later, Swallow now is head of his department and Robyn works there. Robyn is working on a thesis on de industrial novel and get's caught into a program in which she has to walk around a factory with Victor for month's. I haven't finished the last book yet and I'm not sure if I'm going to. 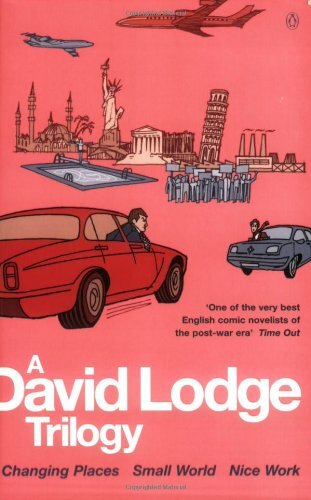 I really enjoyed the trilogy but 900 pages of David Lodge is just a but too much to read all at once... I really liked his sense of humour and his way of telling the story but it's the same trick in all three books. I'm going to read some other books first. Maybe I'll return to Lodge in some time, but maybe I'll just pass the book on. I think other people should read it too, because it's very smooth, funny and relaxing. I digged this book up from somewhere in the pile during the Dutch BC-meeting today. Judging from the text on the back, the picture on the front and the first few sentences I read, it should be very funny. I finished Part One of the trilogy this morning and I absolutely loved it. It's a quick read (the fact that it took me longer than expected had to do with other circumstances, not at all with the readibility of the book) and really really funny. I burst out in laughter a lot. One thing that I found very amusing, was the way the writer made fun of his own writing style. For instance: in the middle of a part that consists completely of letters back and forth between the main characters, Hilary writes to her husband in one of the letters "There's a whole chapter on how to write an epistolary novel, but surely nobody's done that since the eighteenth century?" He does a similar thing with using flashbacks, and at the end of the book. I found that really funny. The book changes styles a lot, which works quite well, because before you get tired of a specific style, he switches but not so often that it would make you dizzy. I'm curious about the second and third part of the trilogy, but I've got some bookrings that must go first, so for now Mr Lodge must go back to living (temporarily of course) on Mount TBR. ... And three whole years later I finally finished the last part of this trilogy. All three parts were well-written, very funny, with believable and memorable characters. I still like the first part best though, although that may be because it was my first experience with Mr Lodge's writing. Part 2 contained so many different stories and characters that every time I hadn't read in a few days, I had to reread half the book when I came back to it, because I forgot where I left all of characters last time I saw them... I did enjoy the ending very much though, the effect of so many things coming together couldn't have been reached without all those different stories of course. Part 3 reminded me more of the first part, with two main characters getting introduced to the other person's world. I really liked the character of Robyn, and recognised a lot in the doubts and discussions that take place about the use of University education and research to the society as a whole... Although I found this part the least funny of the three, it did make me laugh out several times, and I enjoyed reading it. Maybe, like tijgetje says in her journal, it was just less funny because it was the same "trick" in all three books... I definitely think I would have enjoyed the books less if I had read them right after each other. I've gotten some requests of people wanting to read Lodge's trilogy too, so I'll see if they still want to. I got this book from Sarana a while ago and I just read the first novel of this trilogy, so it's time for a little update. I really liked 'Changing places'. After a couple of chapters I really got into the story and the very original writing styles in the novel made it a great read.